Having listened to the weather warnings forecasting storms and gale force winds, Our trusty band of some 18 photographers arrived at our meeting place suitably attired for the promised Arctic conditions. It never arrived. The party left promptly at 8.30a.m. 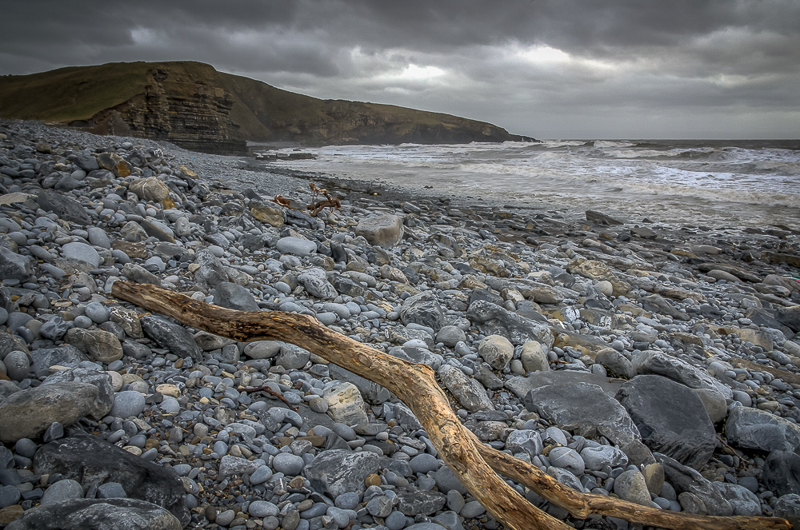 and arrived at Dunraven Bay some hour later. We were greeted by some crashing waves somewhat nearer to us than had been predicted. Yes, the tide was in; not the first time that we have misunderstood the intricacies of a Tide Timetable. Unperturbed, the group immediately started clicking away and soon became engrossed In their pursuit of the perfect picture. So engrossed in fact that two of our members ( names available for a small fee.) got more than sea spray to contend with and succeeded in having a Surf Shower. – unfortunately, no one got this picture. Having spent some time at the sea front, we started our ascent of the adjacent hill. A more relaxed walk than the Three Cliffs forced march. Nevertheless, ’base camp’ was established after we ascended the first rise and some sensible souls took refreshment at this stage. After recovering from their oxygen debt problems, we continued to ascend the escapement and continued across the top of the hill, photographing some wonderful coastal vistas from this high vantage point. It was whilst we were at the highest point, with photographers clinging to the edge to get that perfect shot, that the promised wind suddenly arrived and some sensible soul (name supplied for a fee.) suggested that we were ‘bloody mad’ and needed to turn back. Which we did. We arrived back at the Bay to do some more snapping and took the obligatory ‘Group Photo’ after one of our members (name supplied for a fee)had eventually finalised his portfolio. A decision was then made to visit ‘Ogmore Castle’ and this we did. The Castle wasn’t at its most photogenic on this particular day but other opportunities did arise. At this point some ( the ones that insist on this element as being obligatory)returned for their usual repast at ‘The Three Golden Cups.’ The pub can be highly recommended and served an excellent meal. Although, being followed into the car park by the landlady suggesting we hadn’t paid for one of the meals wasn’t the best way to complete. We think she got it wrong, - anyone wish to admit it was their error? Travelling back in the car, the driver was made to listen to the Swansea game on the radio. The sight of two fans crying at the final whistle did not improve the mood. Despite this, an enjoyable and unexpectedly dry day was had by all and our thanks go to the organisers for yet another very successful excursion.